Hard-working bartenders constantly have wet hands, dip their digits into harsh chemical sanitizers, & need to repeatedly wash their hands throughout a shift. All this leads to dry, chapped, and even cracked hands. Vincent Skin Care was created by a bartending couple, Eric Uhrynowski and Pamela Maguire, who together found their own solution to this problem. 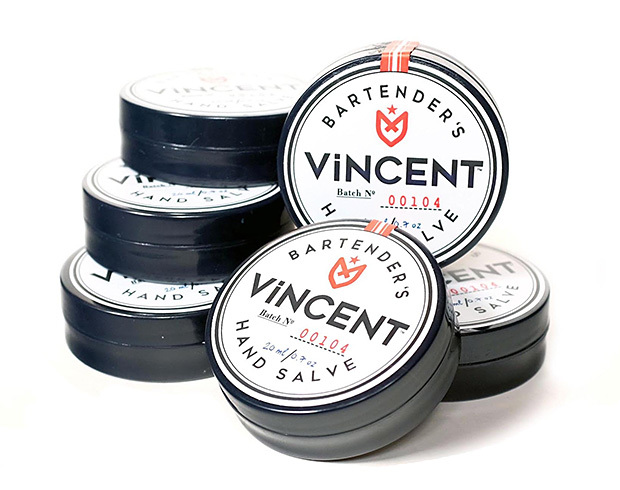 Bartender’s Hand Salve is it: it provides natural moisture & a waterproof barrier plus it’s paraben, phosphate, & scent-free.